Are we up for the Cup? Boro try and knock down giant killers Newport County in the 4th Round of the FA Cup at the Riverside. Middlesbrough dominated the battle of the two Boro teams in the 3rd round can we now win the battle of the Transporters? Kick off by the Tees this Saturday kick off 3pm. After all the trials and tribulations in the league Boro dive headlong into the oldest knockout trophy in world football. Could we have new signing John Obi Mikel in the ranks. The Nigerian midfielder is one of the most decorated footballers ever to pull on a Boro shirt. Can the presence of the man that has seen and done it all with Chelsea have a positive and calming influence on all around him for the remainder of the season? We might need that calm tomorrow as Boro take on the team from Tony Pulis hometown. One of several links we have to the industrial town on the South Wales coast. With the only other working Transporter Bridge in the country we have so often been drawn into comparison. Their Transporter has a proper authentic gondola, ours has wings and a lift. Theirs is older, ours is longer. Newport County fell into the abyss after bankruptcy and went out of business, a glimpse of what might have happened at Boro had not Steve Gibson rounded up a consortium and reached a settlement just a few minutes before the deadline hour. County had to start again and it was only the fans stubborn determination and dedication that saw them rise again like a phoenix to be league and cup contenders. But what about the football? Well, people have complained this season about being poorly served for entertainment and indeed results in the league. There was none of that against Peterborough in the last round. Although the game started tamely we really opened up after the break. Britt recorded a brace and Boro cracked in FIVE. We might expect a tougher contest tomorrow from the team that have become serial giant killers. They have struggled in the league but their hometown manager, Michael Flynn presided over a victory against our League rivals Leeds last season before taking Spurs to the wire and a replay. Of course they defeated Leicester City at Rodney Parade in the 3rd Round before Foxes fan Gary Lineker and the live BBC audience. So, even if away from their own stomping ground and shooting well above their league level this is a club that doesn't know when to lie down and die do not expect them to make it in anyway easy for us. Oh and talking about their Welsh origins, if Newport were to win tomorrow then it would complete the full list of Boro Cup defeats to Welsh League sides. Wrexham, Cardiff and Swansea all inflicted cup shocks on us before. Let's not extend that list to the only team missing from the list. This is the romance of the FA Cup alright. Two managers from different generations but brought up a couple of streets apart. Two clubs with a shared history over closure and almost being obliterated with football history. And two towns born from the toil of heavy industry with their once innovative and now iconic Transporter Bridges. Two very proud bands of supporters then. Let's make it a special atmosphere this weekend. A special FA Cup atmosphere. Something to saviour. Get yourself down to the Riverside and help make this a real occasion. If it wasn't for all the efforts off the field in 1986 then we would not be here today. Newport remind us of just how that much means to everyone. Just imagine Teesside without its football team and without those moments of cup triumphs, promotions, big signings of Juninho to John Obi Mikel and then all those local young players like Lewis Wing, Marcus Tavernier and Dael Fry. Stewy Downing was there once. Imagine if none of that had happened. Both teams, both towns know that feeling only too well and have so much to be thankful for. Never take it for granted. 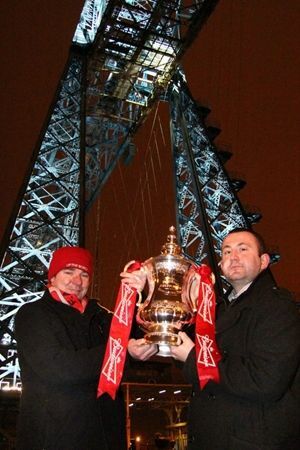 Come On Boro – Let's get up for the cup and defeat Newport County.